Complimentary First Class toiletry amenity kits are a surprisingly big business for airlines. The luxury offerings are constantly being revamped to incorporate new high-profile fashion designers in order to give frequent fliers something to look forward to, and most importantly, a reason to stay loyal. First Class kits are usually packed with pamper products from top beauty brands — including Aesop, Aromatherapy, Bulgari and Ferragamo — to keep passengers feeling hydrated and rejuvenated while in the sky. Some major airlines now also offer their premium passengers with designer in-flight sleeper suits and slippers to ensure the ultimate comfort during overnight long-haul flights. Scroll down for the 11 Best First Class Amenity Kits in the world ranked in ascending order. 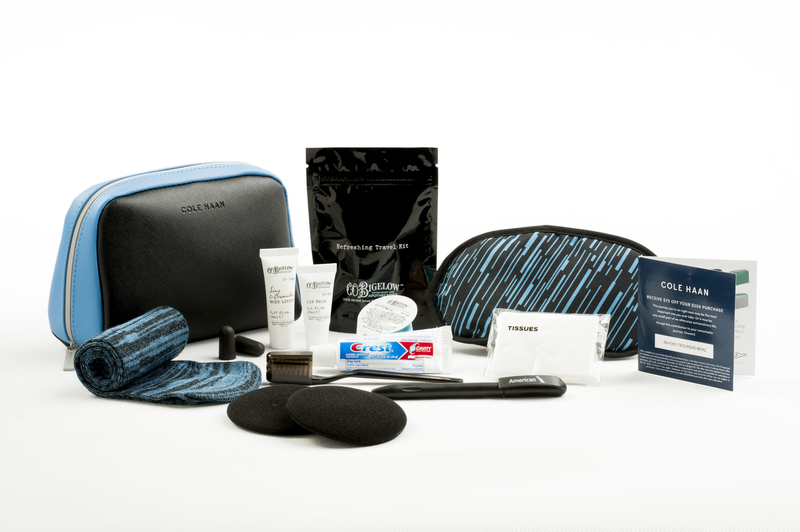 United has teamed up with UK spa brand Cowshed for its luxury amenity kits available to first and business class passengers on long-haul flights. The faux-leather washbags contain a number of spa goodies, including a chamomile refreshing toner towelette, a jasmine toning eye balm sachet, lip balm, hand cream and a quinoa face cream. Other comfort items offered within the kit are a padded eye mask, comfortable socks, and travel essentials, such as a toothbrush, toothpaste and a comb. The refreshed Delta One kits have been created in collaboration with two premium brands — luggage specialist TUMI and American cosmetics brand Kiehl’s — and are offered on Transoceanic international flights, as well as on routes between JFK and Los Angeles or San Francisco international airports. Passengers travelling outbound from the US receive a navy hard-sided amenity kit, while customers heading to the US can expect a soft-sided black kit. The packs contain Kiehl’s lip balm and a grapefruit-scented deluxe hand and body lotion with aloe vera and oatmeal. Delta Comfort+ Premium Coach customers travelling on international flights also receive a Rest and Refresh pack with eye shades, ear plugs and a dental kit containing Colgate toothpaste. Cole Haan designed the amenity pack on American Airlines. First class customers on American Airlines flights are treated to travel essentials from leading skincare and lifestyle brands Clark’s Botanicals and Cole Haan. The airline unveiled a new range of Cole Haan designed amenity packs in January 2017, which also include pyjamas. British brand Liberty London has collaborated with British Airways on an exclusive range of amenity kits for customers flying first class with the airline. They were first introduced on selected flights between London and LA in January 2017, and has been rolled out across the rest of the first class network since. The stylish washbags have a contemporary look, using prints from Liberty London’s textiles archive. The women’s version features the eye-catching ‘Christelle’ oriental inspired floral print, and comes with a convenient wristlet. The men’s washbag is made of a black embossed textured exterior, with ‘Felix Raison’ paisley motif printed lining. The kits contain a range of well-being products provided by Aromatherapy Associates. The airline that is expected to launch the world’s first non-stop flights between Australia and London, offers its First Class guests Martin Grant-designed sleepwear in addition to amenity kits. Grant, Qantas’ creative director of fashion, designed the elegant unisex navy and black trim first pyjamas with 100% cotton, a tailored neckline, and a tapered silhouette, along with matching slippers. Stylish male and female first class amenity kits come in the same navy hues and contain a range of bespoke ASPAR by Aurora spa products, Martin Grant-designed travel socks, dental kit, ear plugs, and deodorant. A Martin Grant-designed eye mask that cups the eyes for maximum light blockage is also included. Air France’s La Première customers have been enjoying brand new comfort kits since February 2017. The French Carita brand is supplying each kit with a moisturising face cream, a supreme wrinkle solution for the eyes, a luxury hand cream, lip balm, face pack, as well as an exclusive offer for a hair treatment and styling session. The amenity kit is available in two colours, and also comes with travel essentials, such as ear plugs, a comb, and a pen. In addition to the luxury products included in the La Première comfort kit, Carita make-up removers and moisturising treatments are availabale to all La Première passengers at any time during their flight. Fashion designer Christian Lacroix and Hungarian skincare brand Omorovicza have teamed up with Etihad Airways on new luxury amenity kits for its first class cabins, widely recognised as some of the world’s most extravagant. Both the male and female embossed bags come in two rich colours, plum for ladies and grey for men.‎ A second phase will see new kits in burgundy for ladies and black for men. The ladies’ bag is designed to be used as a chic clutch, while the men’s can be used buttoned down as a washbag or, when opened flat, as storage for tablet devices. The bags contain four anti-ageing and rejuvenating products from Omorovicza’s ‘Gold’ collection. In-flight items include a perfecting lip balm, a facial moisturiser with cooling gel-cream, a nourishing hand treatment and a refreshing cleansing wipe. The Cathay Pacific first class amenity kit is loaded with products from Australian brand Aesop. The specially designed case comes in a grey zip-top case for men, while the ladies’ version is a camel zipped case. Inside, first class guests can expect the likes of hand cream, lip cream, face cream, a toothbrush, toothpaste, mouthwash, earplugs, a hairbrush, a monitor-cleaning cloth, and cotton pads. Aesop items on offer include a hydrating facial cream, rosehip seed lip cream, and rind concentrate hand & body balm. Qatar’s award-winning first class amenity kits were created by luxury luggage designer BRIC’s and bespoke bag designer Nappa Dori. The bags contain a selection of skincare products from Italy’s Castello Monte Vibiano Vecchio. First class guests now also get to enjoy a new sleeper suit, developed with UK luxury lifestyle brand The White Company. The men’s suit is designed in a charcoal grey marl, and the women’s in a contemporary mid-grey. Both are made of 100% cotton, and come with matching luxury cotton slippers, with a faux fur interior sole for extra warmth and comfort. The second best kit in the skies is on Sinapore Airlines. 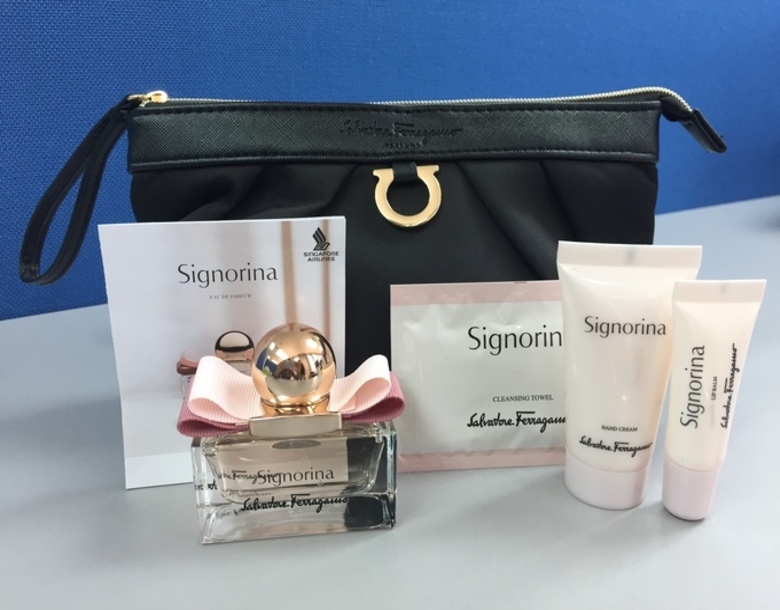 Italian luxury goods company Salvatore Ferragamo supplies products for both the male and female first class amenity kits. The men’s grey toiletry kit features a 30ml Eau de Toilette from the Acqua Essenziale BLU range, while the ladies’ toiletry bag includes a 30ml Eau de Parfum sample from the Signorina Eleganza edition. Both bags contain a lip balm, after shave balm and cleansing towel. 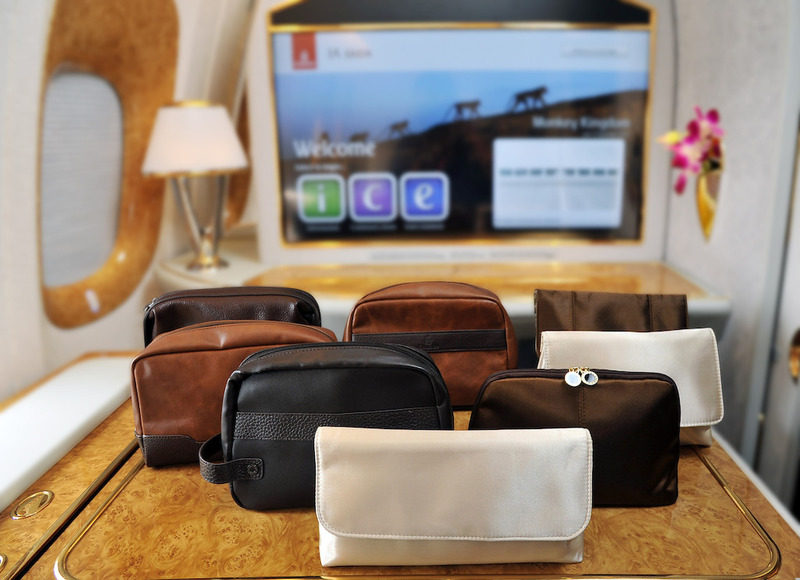 There was truly no expense spared in the creation of Emirates’ new first class amenity kits, the best in the world. The airline offers the world’s first moisturising lounge wear designed for passengers travelling in its first class cabins on overnight long-haul flights. The suits use a patented technology designed to keep skin hydrated during the flight, and also lock in the moisture for up to 10 washes, so they can be re-used by other passengers. Packaged in a stylish felt pouch, the suits come with matching slippers and eye mask. The new amenity kits, offered to both first and business class passengers on long-haul flights, feature Bulgari’s woody floral fragrance – Eau Parfumée au thé noir — and contain skincare essentials to keep customers feeling pampered throughout the flight. The first class kit bags are made from real leather and come in eight designs in charcoal grey for men and pale grey for women. Added extras to the Emirates first class experience include the use of a plush, faux sheep-skin blanket, and a range of new luxury spa products which can be used in the signature Airbus A380 plane’s shower spa on board.